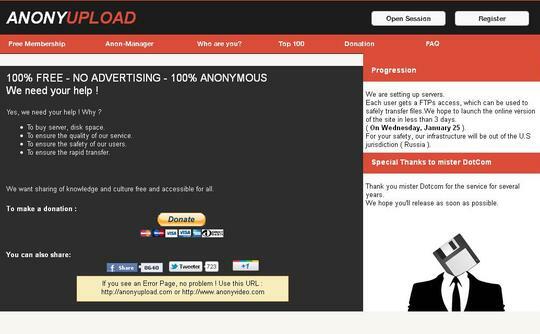 Anonymous Launched an Alternative to Megaupload? Home Web Anonyupload : Anonymous Launched an Alternative to Megaupload? Following the closure of Megaupload, Anonymous apparently looking to launch a free alternative – without any restrictions or advertising – called Anonyupload. The new site called anonyupload.com not be a clone of Megaupload but promises to be free, ad-free and anonymous. Where each user receives an FTP access can be used to transfer files securely. Also the official website mention that – “There are many other reasons why using a single host is bad, if you have been aware of the megaupload.com story, even though you liked the website, you can see that its owner made much more money than what was required to pay for the infrastructure. Big and centralized websites can make a lot of money just by putting a single advertisement on their pages”. Thank you DotCom for the past years of services. We hope you’ll be released as soon as possible. Try to not make that amount of money next time, and it should be alright. In theory, the service will be launched on January 25 and run like the old school IRC file sharing – based on FTP servers but with the advantage of being “Anonymous”.